Assistive technologies include any item, piece of equipment or product used to increase, maintain or improve the functional capabilities of people with disabilities. Assistive technologies include low-vision devices, hearing aids, augmentative and alternative communication systems, walking frames, wheelchairs and prostheses such as artificial legs. In addition to low-cost, simple products, more advanced solutions exist, such as screen-reading software, customized telephones and computer-assisted devices. Assistive technologies can benefit a wide range of people, including those with disabilities; those with age-related frailties; those affected by noncommunicable diseases, such as stroke and diabetes; and those requiring rehabilitation. These technologies therefore have the potential to play a significant role in enabling large sectors of society to function and live independently or, at least, less dependently. These technologies also have socioeconomic benefits, by reducing direct health and welfare costs, enabling a more productive labour force, and stimulating economic growth. They can enable older people to continue to live at home and can delay or prevent the need for long-term care; they also enable people with difficulties in functioning to live independent, productive, healthy, dignified lives, and to participate in education, the labour market and social life. The World report on disability estimated that, based on population data from 2010, more than one billion adults and children worldwide – 15% of the global population – were living with some form of disability – a substantial increase from the previous estimate of about 10% in the 1970s. Of those aged 15 years and older living with a disability, an estimated 2.2–3.8% had significant difficulties in functioning. In the same report, analysis of the Global Burden of Disease (GBD) data from 2004 allowed estimates of the prevalence of disability by World Health Organization (WHO) region. Although there is substantial uncertainty about the GBD estimates for regions and conditions where the data are scarce or of poor quality, the WHO South-East Asia Region was reported to have the second highest prevalence of moderate disability (16%) and the third highest prevalence of severe disability (2.9%). Since potential beneficiaries of assistive technologies include not only people with disabilities but also the increasing numbers of those living longer, those with noncommunicable diseases and those requiring rehabilitation, it is clear that they comprise a significant proportion of the world’s population. International frameworks and instruments have reiterated the commitments of governments and other stakeholders to support implementation and monitor progress that is relevant to assistive technologies. Chief among these is the United Nations Convention on the Rights of Persons with Disabilities (CRPD), which was adopted in 2006 and, at the time of writing in 2018, has been ratified by 177 States Parties. Although the CRPD mandates access to good quality and affordable assistive technologies for people with disabilities, progress in implementation in low- and middle-income countries has been slow, not least because of a lack of funding support. With respect to the Sustainable Development Goals (SDGs), disability is referenced specifically in the goals related to poverty (SDG 1); education (SDG 4); growth and employment (SDG 8); inequality (SDG 10); accessibility of human settlements (SDG 11); and peace and inclusivity (SDG 16); disability is also directly referenced in 12 SDG indicators. However, assistive technologies are relevant to the SDGs even where disability is not specifically mentioned, and analysis indicates that achievement of all 17 SDGs can be achieved only by improved access to these products. The need to improve the accessibility of assistive devices has been underscored by WHO in recent years. The WHO global disability action plan 2014–2021 supports the implementation of measures designed to meet the rights of people with disabilities as enshrined in the CRPD. There are three objectives: (i) to remove barriers and improve access to health services and programmes; (ii) to strengthen and extend rehabilitation, habilitation, assistive technology, assistance and support services, and community-based rehabilitation; and (iii) to strengthen collection of relevant and internationally comparable data on disability, and support research on disability and related services. Among the indicators of success of the second objective is the proportion of people with disabilities that receive the assistive technologies that they need. In 2014, WHO established the Global Cooperation on Assistive Technology (GATE), an initiative in partnership with international organizations, donor agencies, professional organizations, academia, and user groups, to improve access to high-quality affordable assistive products worldwide. In 2016, GATE launched the Priority assistive products list., The priority products are defined as “Those products that are highly needed, an absolute necessity to maintain or improve an individual’s functioning and which need to be available at a price the community/state can afford”. Three additional tools are under development to assist countries to develop national assistive technology policies and programmes, as an integral component of universal health coverage. These are a policy framework, a training package and a products service-delivery model. The WHO Global strategy and action plan on ageing and health in 2016 noted that harnessing innovations such as assistive technologies may also help low- and middle-income countries to develop service models that “leapfrog” models delivered in other settings. One of the 10 mid-term progress indicators of the 2016–2020 action plan is the number of countries with legislation or regulations that support older adults to obtain access to assistive devices on the WHO Priority assistive products list. In May this year, the World Health Assembly adopted Resolution WHA71.8, which drew together the aims of the CRPD and SDGs, urging Member States to develop, implement and strengthen policies and programmes to improve access to assistive technologies within universal health and/or social services coverage. As a consequence, WHO will, by 2021, report on effective access to assistive technology based on the best available scientific evidence and international experience, and will subsequently report back to the World Health Assembly every 4 years until the end of the SDGs in 2030. This reporting requirement holds all actors accountable for improving access to assistive technologies. This perspective paper reviews the needs and demands for assistive technologies, identifies various gaps and suggests potential solutions to improve access, in particular in low- and middle-income countries. It is well recognized that the need for assistive technologies is high but demand is low, and supply is even lower, especially in low- and middle-income countries. This mismatch between need and demand itself presents a challenge to improving access, and is the result of many factors, not least a widespread lack of awareness among potential beneficiaries, their caregivers, and their health-care providers. Only 10% of potential beneficiaries have access to assistive products, owing to factors such as high costs and lack of financing, availability, awareness and trained personnel. For example, 70 million people need a wheelchair but only 5–15% have access to one, and production of hearing aids meets only 10% of global need and 3% of the need in low- and middle-income countries. Moreover, 200 million people with low vision do not have access to spectacles or other low-vision devices. A survey of the needs of older people living with disabilities in six countries in the WHO Western Pacific Region found they gave higher priority to functional daily living than to social activities. The top four functional activities that could be facilitated by assistive technologies were: eating and drinking as independently as possible; transferring to or from a bed or a chair; being able to be clean and hygienic; and being able to hear and communicate with others. There are other examples of the role of assistive technologies in prevention. For instance, housing modifications and provision of appropriate assistive technologies can reduce the need for long-term care for people with physical disabilities. Access to appropriate and affordable assistive devices can enhance the autonomy of people with disabilities. Self-care technologies contribute to a reduction in care hours and enhanced autonomy. Despite these benefits, the use of assistive technologies for prevention is low. For example, in six low- and middle-income countries where the most rapid growth in the population aged 65 years and older is expected – Brazil, Cambodia, Egypt, India, Turkey and Zimbabwe – all had some assistive technologies designed for older adults with existing disabilities, but had limited technologies designed to prevent impairment and disability among older adults. As noted earlier, despite high levels of need in low- and middle-income countries, lack of awareness of assistive technologies results in a lack of demand, which in turn impedes their development and adoption. For those who are aware of these technologies, as is more common in high-income settings, use is further hindered by concerns about their effectiveness and suitability; social stigma and privacy; usability and computer literacy; and affordability. Research, development and design processes have yet to include consultations with users and caregivers to develop products to best suit their physical and social environments and preferences. Although computer and information technologies hold promise in applications to boost the functions of existing assistive technologies, product designers have yet to consult and accommodate the different preferences and needs of older people with disabilities. Challenges associated with usability often relate to screen design, input device design, complex commands and operating procedures. With respect to low- and middle-income countries, international cooperation and global health actors championing assistive technologies have yet to lead to increased support for technology innovation or transfer of technologies and expertise. Thus, in these settings, where imported products are unaffordable, there may be limited capacities to produce assistive technologies locally. In addition, lack of affordability means that many of the high-technology devices created for low-resource settings are actually only affordable in more affluent emerging economies. There is also concern that these technologies are developed without taking into consideration the true environmental, social and resource factors that impede the adoption of technology in low-resource settings. Challenges to improving access to assistive technologies in low- and middle-income countries stem from low production and limited quality; financial barriers; and lack of government funding, provisions and human resources. There is a scarcity of personnel trained to provide these technologies, especially at provincial and district levels. In many settings where access might be possible, the costs are prohibitive. Even in high-income settings, such as the USA, access to these technologies and qualified providers is frequently limited and varies considerably across states and districts, as well as urban and rural areas. Factors such as culture and language, expectations, legal constraints, stereotyping, autonomy and dignity also hamper access to assistive technologies. A systematic review of barriers to adoption of assistive technologies by older people found that privacy was their top concern, followed by worries about trust, functionality and added value. Other key barriers were cost and affordability; ease of use and suitability for daily use; perception of “no need”; stigma; fear of dependence; and lack of training. As discussed earlier, demand-side barriers contribute significantly to the gaps in access to and use of these technologies. At all levels – policy-makers, care providers and potential beneficiaries – there is a lack of understanding about the benefits of assistive technologies and a lack of information about what devices are available. It is critically important to understand and address the mismatches between high need and low demand, to devise policies to improve access to and use of assistive technologies. There is a significant lack of data overall on the size of unmet need in this area. For example, accessibility in individual countries can be difficult to estimate, since the CRPD States Parties’ reports provide only the number of people with disabilities who have access to these technologies but not the total number of people with disabilities who need them, so the proportions whose needs are being met and unmet are unknown. Furthermore, although it is acknowledged that there is a large and growing need for assistive technologies within low- and middle-income countries, there is a lack of research in these settings, which hinders the development of evidence-informed policy and practice. A scoping review of research on assistive technologies from low- and middle-income countries and other research-limited settings from 2000 to 2016 aimed to characterize the evidence available. The review found that, of the 252 studies included, over 80% focused on types of assistive technology addressing mobility (45.2%) and vision (35.5%) needs, with spectacles and prosthetics accounting for over 50% of all publications. The review found that evidence was most lacking on assistive technologies to address hearing, communication and cognition needs. Unsurprisingly, most research assessing the effectiveness of various types of assistive technologies is from high-income settings. Several reviews summarizing findings to date have highlighted the lack of high-quality, well-designed research in this area. For example, while much has been published on the potential role of electronic assistive technology for memory support to people with dementia, assessments of effectiveness have been of low quality. Likewise, although assistive technology is one of the most frequent interventions used by people with rheumatoid arthritis, a systematic review found only one small randomized trial of low quality assessing a device that is not commonly used. The absence of reliable information on effectiveness is a gap that urgently needs to be addressed. This is critical not only for informing more rational use of resources in the high-income settings where such technologies are available, but also to allow evidence-informed decisions in lower-income settings. In assessing the impact of assistive technologies, the outcome measurement should be relevant not only to the target populations, but also, importantly, to families and caregivers. In addition, there are limited numbers of rigorous cost analyses of assistive technologies for people with dementia and their caregivers. Based on the GATE workplan,, there are four overarching, interlinked solutions for countries to improve access to assistive technologies. First, a national policy framework for assistive technology is needed, with adequate funding support and a focal unit to promote intersectoral actions. Second, product development by research and development partners should be encouraged through incentive schemes that support and promote affordable assistive products. Third, capacity-building of personnel is needed, through undergraduate and in-service training, as well as training of formal and informal caregivers. Fourth, provision needs to be enhanced, especially through integration of services with the health system. Several key focus areas are described next. In the World Health Assembly Resolution WHA71.8, Member States are urged to develop a national list of priority assistive products that are affordable, cost effective and meet quality and safety standards, based on the Priority assistive products list., It is anticipated that national lists will trigger awareness among health-care providers, especially if governments also commit to allocating adequate funding to improve delivery systems and training of health workforces. In turn, health awareness among professionals, and improved availability of these priority assistive devices, should gradually increase public awareness and demand. WHO initiated GATE as a platform for international collaboration across governments, United Nations agencies and civil society groups, to incentivize the development of products that are affordable for adoption in developing countries., The Priority assistive products list should stimulate interest in improved product designs that take into account user-defined needs to facilitate wider adoption and use. Promoting low-cost locally produced items, raising awareness and fostering targeted research will improve access. 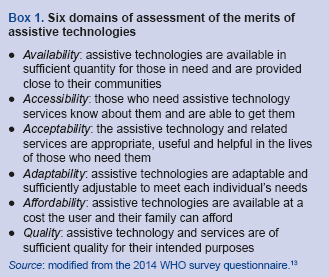 Six criteria for assessment of the merits of assistive devices are described in [Box 1]. In the context of the SDGs and universal health coverage and the adoption of World Health Assembly Resolution WHA71.8, governments need to embed assistive technologies and associated services in health and community services, and subsidize the provision of assistive devices and services such that they are free of charge. Government subsidies for assistive technologies are required, as household out-of-pocket payment for these services can be a major barrier to access. In-service training of existing cadres of health personnel can be rapidly scaled up to support the initiation or strengthening of service provision. This should run in parallel with a long-term plan for undergraduate curriculum development and training. Focus should be on improving the economies of scale in manufacturing and assembling products locally, and reducing or exempting import duties, especially where importing countries do not have local production capacities. Appropriate products should be made available and properly prescribed and fitted; users should receive proper training with appropriate follow-up; and societal and environmental barriers should be removed. Effective multisectoral collaborations contribute to a holistic approach to fostering functional capability and autonomy among all potential beneficiaries of assistive devices. This requires a whole-of-government approach. Universal designs for assistive technologies, buildings, transport, and information and communication technologies require multisectoral actions across government and business sectors. Multisectoral involvement, especially of governments, manufacturers, users and consumers, can be embedded in the national assistive technology policy framework. For example, in a project in Thailand, architects and engineers supported design and housing modifications to enable independent living by people with disabilities, with community involvement and funding support from local government. Government agencies, industries and research groups demonstrated successful innovation in assistive technology through coordinated knowledge transfer, partnerships and focused funding that support training, local research and development, and manufacture of high-quality solutions, with involvement and active participation by people with disabilities. Effective governance of multisectoral action requires leadership capacity across sectors and levels of government and cultivation of champions in different sectors who can agree on common objectives. Regular surveys of needs and unmet needs for assistive technologies are critical for public monitoring of progress and holding governments accountable. This evidence should be made public and used to ensure accountability, especially regarding commitments to the CRPD and SDGs. Data on unmet needs have been collected in high-income settings,, and also in low- and middle-income countries, as shown by reports from Namibia, Malawi, and Zambia. Culturally relevant assistive technologies for specific subpopulation groups also help to minimize unmet needs. The World Health Assembly Resolution WHA71.8 urges WHO Member States to promote investment in research and development, innovation and product design, in order to make existing assistive products affordable and to develop a new generation of products, including high-end or advanced assistive technology. This can be done by taking advantage of universal design and new evidence-based technologies, in partnership with academia; civil society organizations, in particular with people with disabilities and older persons and their representative organizations; and the private sector. The potential beneficiaries of assistive technologies include not only people with disabilities but also the increasing numbers of those living longer, those with noncommunicable diseases, and those requiring rehabilitation. Despite this large and increasing need, assistive technologies can have low rates of adoption and use, resulting from low levels of awareness and, consequently, demand. There are also gaps between product designs and user preferences and needs, including those of caregivers and health-care providers. Affordability is a major barrier in low- and middle-income countries where governments do not invest adequately in service provision and training of human resources. There is limited evidence to show that assistive technologies improve the functioning of users. This requires action by the scientific community, research and development agencies, and the manufacturing sector, to fill these gaps through consultation with potential beneficiaries and, as appropriate, their caregivers. Various global frameworks such as the CRPD and SDGs support governments in improving access to these technologies, although progress is often impeded by a low level of country capacity, and inadequate fiscal space and financial commitment to embed assistive technologies into service provision. Global collaboration, in parallel with national-level multisectoral actions, is essential to enhance access to these technologies, to mitigate the effects of impairment and empower users through greater autonomy. Acknowledgements: We recognize and acknowledge the contributions of researchers and civil society organizations who consistently bring the challenges faced by people with disabilities to the policy agendas and monitor government implementation of the United Nations Convention on the Rights of Persons with Disabilities. Authorship: VT designed the work. All authors contributed equally in writing. WP commented on the first draft. VT finished and finalized the work. All authors approved the final draft. WHO global disability action plan 2014–2021: better health for all people with disability. Geneva: World Health Organization; 2014 (http://apps.who.int/iris/bitstream/handle/10665/199544/9789241509619_eng.pdf;jsessionid=CEE5C6A87F79802B0318C40DB5B2FF45? sequence=1, accessed 25 June 2018). Resolution WHA71.8. Improving access to assistive technology. In: Seventy-first World Health Assembly, Geneva, 21–26 May 2018. Geneva: World Health Organization; 2018 (http://apps.who.int/gb/ebwha/pdf_files/WHA71/A71_R8-en.pdf, accessed 27 June 2018). World report on disability. Geneva: World Health Organization; 2011 (http://www.who.int/disabilities/world_report/2011/report.pdf, accessed 25 June 2018). United Nations Department of Economic and Social Affairs Division for Inclusive Social Development. Convention on the Rights of Persons with Disabilities (CRPD) (https://www.un.org/development/desa/disabilities/convention-on-the-rights-of-persons-with-disabilities.html, accessed 25 June 2018). Borg J, Lindström A, Larsson S. Assistive technology in developing countries: a review from the perspective of the Convention on the Rights of Persons with Disabilities. Prosthet Orthot Int. 2011;35(1): 20–9. doi:10.1177/0309364610389351. United Nations. Sustainable development goals: 17 goals to transform our world (http://www.un.org/sustainabledevelopment/sustainable-development-goals/, accessed 26 June 2018). Disability in the SDGs indicators. New York: United Nations; 2016 (http://www.un.org/disabilities/documents/2016/SDG-disability-indicators-march-2016.pdf, accessed 25 June 2018). Tebbutt E, Brodmann R, Borg J, MacLachlan M, Khasnabis C, Horvath R. Assistive products and the Sustainable Development Goals (SDGs). Global Health. 2016;12(1):79. doi:10.1186/s12992-016-0220-6. World Health Organization. Public health, innovation, intellectual property and trade. Global Cooperation on Assistive Technology (GATE) (http://www.who.int/phi/implementation/assistive_technology/en/, accessed 27 June 2018). Priority assistive products list. Improving access to assistive technology for everyone, everywhere. Geneva: World Health Organization; 2016 (http://www.who.int/phi/implementation/assistive_technology/low_res_english.pdf, accessed 25 June 2018). Global strategy and plan of action on ageing and health. Geneva: World Health Organization; 2016 (http://www.who.int/ageing/WHO-GSAP-2017.pdf?ua=1, accessed 25 June 2018). Improving access to assistive technology. Report by the Director-General. In: Seventy-first World Health Assembly, Geneva, 21–26 May 2018. Provisional agenda item 12.5. Geneva: World Health Organization; 2018 (A71/21; http://apps.who.int/gb/ebwha/pdf_files/WHA71/A71_21-en.pdf, accessed 25 June 2018). Survey of needs for assistive and medical devices for older people in six countries of the WHO Western Pacific Region: China, Japan, Malaysia, the Philippines, the Republic of Korea and Viet Nam. Geneva: World Health Organization; 2014 (http://www.who.int/kobe_centre/ageing/ADMD_Survey_Report.pdf, accessed 25 June 2018). WHO global report on falls prevention in older age. Geneva: World Health Organization; 2007 (https://extranet.who.int/agefriendlyworld/wp-content/uploads/2014/06/WHo-Global-report-on-falls-prevention-in-older-age.pdf, accessed 25 June 2018). Health Quality Ontario. Prevention of falls and fall-related injuries in community-dwelling seniors: an evidence-based analysis. Ont Health Technol Assess Ser. 2008;8(2):1–78. Rubenstein LZ. Falls in older people: epidemiology, risk factors and strategies for prevention. Age Ageing. 2006;35 Suppl. 2:ii37–ii41. doi:10.1093/ageing/afl084. Habib MA, Mohktar MS, Kamaruzzaman SB, Lim KS, Pin TM, Ibrahim F. Smartphone-based solutions for fall detection and prevention: challenges and open issues. Sensors (Basel). 2014;14(4):7181–208. doi:10.3390/s140407181. Atoyebi OA, Stewart A, Sampson J. Use of information technology for falls detection and prevention in the elderly. Ageing Int. 2015;40(3):277–99. doi:10.1007/s12126-014-9204-0. Tongsiri S, Ploylearmsang C, Hawsutisima K, Riewpaiboon W, Tangcharoensathien V. Modifying homes for persons with physical disabilities in Thailand. Bull World Health Organ. 2017;95(2):140–5. doi:10.2471/BLT.16.178434. Abrilahij A, Boll T. A systematic review of self-care assistive technologies for aging population. In: Boll T, Ferring D Valsiner J, editiors. Cultures of care in aging. Charlotte (NC): Information Age Publishing; 2018:273–313. Marasinghe KM, Lapitan JM, Ross A. Assistive technologies for ageing populations in six low-income and middle-income countries: a systematic review. BMJ Innov. 2015;1(4):182–95. Report to Congress: aging services technology study. Washington (DC): Office of the Assistant Secretary for Planning and Evaluation; 2012 (https://aspe.hhs.gov/basic-report/report-congress-aging-services-technology-study, accessed 25 June 2018). Czaja SJ, Lee CC. Designing computer systems for older adults. In: Jacko JA, Sears A, editors. The human–computer interaction handbook. Mahwah (NJ): Lawrence Erlbaum Associates Inc.; 2003:413–27. Engineering for Change. Assistive devices in low-income countries: adaptability and recent innovations. 9 October 2017 (https://www.engineeringforchange.org/news/assistive-devices-in-low-income-countries-adaptability-and-recent-innovations/, accessed 25 June 2018). National Academies of Sciences, Engineering and Medicine; Health and Medicine Division; Board on Health Care Services; Committee on the Use of Selected Assistive Products and Technologies in Eliminating or Reducing the Effects of Impairments. The promise of assistive technology to enhance activity and work participation. Consensus study report. Washington (DC): National Academies Press; 2017 (https://www.ncbi.nlm.nih.gov/books/NBK453289/, accessed 25 June 2018). National Research Council (US) Steering Committee for the Workshop on Technology for Adaptive Aging. Technology for adaptive aging. Washington (DC): National Academies Press; 2004 (https://www.ncbi.nlm.nih.gov/pubmed/22696781, accessed 25 June 2018). Yusif S, Soar J, Hafeez-Baig A. Older people, assistive technologies, and the barriers to adoption: a systematic review. Int J Med Inform. 2016;94:112–6. doi:10.1016/j.ijmedinf.2016.07.004. Eide AH, Van Rooy G, Loeb ME. Living conditions among people with activity limitations in Namibia: a representative, national survey. Trondheim: SINTEF Health Research; 2003. Loeb ME, Eide AH. Living conditions among people with activity limitations in Malawi: a national representative study. Trondheim: SINTEF Health Research; 2004. Eide AH, Loeb M. Living conditions among people with activity limitations in Zambia: a national representative study. Trondheim: SINTEF Health Research; 2006. Srisuppaphon D, Sriboonroj A, Riewpaiboon W, Tangcharoensathien V. Effective implementation of the UNCRPD by Thailand State Party: challenges and potential remedies. BMC Int Health Hum Rights. 2017;17(1):15. doi:10.1186/s12914-017-0123-5. Matter R, Mark Harniss M, Tone Oderud JB, & AHE. Assistive technology in resource-limited environments: a scoping review. Disabil Rehabil Assist Technol. 2017;12(2):105–14. doi:10.1080/17483107.2016.1188170. Van der Roest HG, Wenborn J, Pastink C, Droes R-M, Orrell M. Assistive technology for memory support in dementia. Cochrane Database Syst Rev. 2017;6:CD009627. doi:10.1002/14651858.CD009627.pub2. Tuntland H, Kjeken I, Nordheim L V, Falzon L, Jamtvedt G, Hagen KB. Assistive technology for rheumatoid arthritis. Cochrane Database Syst Rev. 2009;(4):CD006729. doi:10.1002/14651858.CD006729.pub2. Thomas R, Barker L, Rubin G, Dahlmann-Noor A. Assistive technology for children and young people with low vision. Cochrane Database Syst Rev. 2015;(6):CD011350. doi:10.1002/14651858.CD011350.pub2. Bowes A, Dawson A, Greasley-Adams C. Literature review: the cost effectiveness of assistive technology in supporting people with dementia. Report to the Dementia Services Development Trust. Stirling: University of Stirling; 2013 (http://dementia.stir.ac.uk/system/files/filedepot/1/the_cost_effectiveness_of_assistive_technology_in_supporting_people_with_dementia_october_13_1.pdf, accessed 25 June 2018). Rasanathan K, Bennett S, Atkins V, Beschel R, Carrasquilla G, Charles J et al. Governing multisectoral action for health in low- and middle-income countries. PLoS Med. 2017;14(4):e1002285. doi:10.1371/journal.pmed.1002285. Participation and activity limitation survey of 2006: a profile of education for children with disabilities in Canada. Ottawa: Statistics Canada; 2008 (https://www150.statcan.gc.ca/n1/en/pub/89-628-x/89-628-x2008004-eng.pdf?st=gMJ0bJeP, accessed 25 June 2018). Lauriks S, Reinersmann A, Van der Roest HG, Meiland FJM, Davies RJ, Moelaert F et al. Review of ICT-based services for identified unmet needs in people with dementia. Ageing Res Rev. 2007;6(3):223–46. doi:10.1016/j.arr.2007.07.002. Cullen K, Dolphin C, Wynne R. Assistive technology usage and unmet need amongst people with disabilities in Ireland. Analysis of data from the National Disability Survey of 2006. Dublin: Work Research Centre; 2015 (http://nda.ie/nda-files/Assistive-Technology-Usage-and-Unmet-Need-amongst-People-with-Disabilities-in-Ireland1.pdf, accessed 25 June 2018). Orellano-Colón EM, Rivero-Méndez M, Lizama M, Jutai JW. Assistive technology unmet needs of independent living older Hispanics with functional limitations. Disabil Rehabil Assist Technol. 2018;13(2):194–200. doi:10.1080/17483107.2017.1300693.